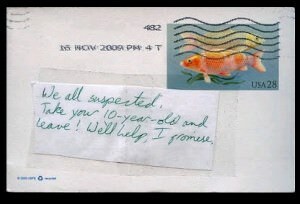 BlindGossip – There is a blog called PostSecret where people send in anonymous secrets and confessions in the form of a postcard. 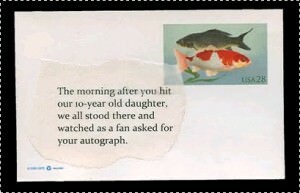 A current postcard reads ” The morning after you hit our 10-year-old daughter, we all stood there and watched as a fan asked you for your autograph.” The postcard is not embellished, and no other clues are given. Who could it be? P.S. Thanks to reader SJ for the tip! Thanks to sharp readers N, Guessing, and Tiara for the update!